Fall’s here, you guys, and I don’t have any new cozy imagery for you — yes, yes the chunky sweaters, the pumpkin spice lattes, people who wear scarves all year round will finally be justified in doing so… One new thing I do have to share is the combination of balsamic vinegar and maple syrup, which I discovered as a dipping sauce for chicken and waffles at Buttermilk Channel on my recent visit to New York. This new (to me) duo can be applied to one of fall’s finest treasures: butternut squash, the sweetest and one of the most common of the squash crew. 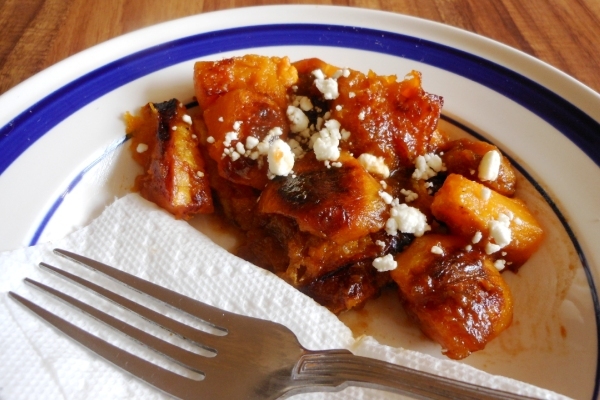 Its flavor is similar to pumpkin or sweet potato. You know, other orange things. 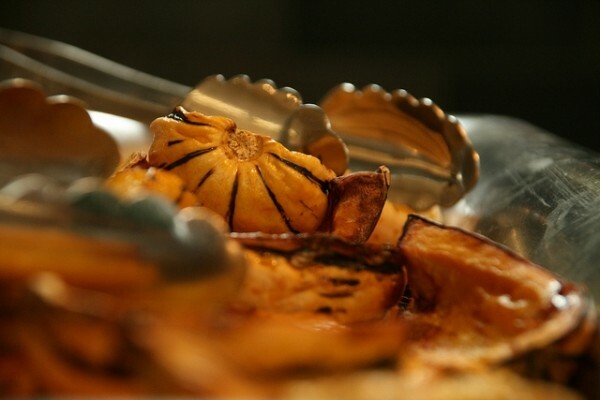 As more and more dining halls are jumping on board with local and seasonal ingredients, you’re likely to find some steamed or roasted butternut squash in the rotation of side dishes in the coming weeks. Roasting gives it a tasty caramelization, and this glaze adds an interesting mix of tangy and sweet with the complexity of both balsamic vinegar and maple syrup. Playing around with other vinegar-based dressings is a great way to get the most out of your dining hall’s condiment selection. Check out Cara and Phoebe’s tutorial and prepare your veggies for the widest array of flavor enhancements you can think up! Try adding some bacon or walnuts for additional elements of texture and flavor. Stir together balsamic vinegar and maple syrup in a small dish with a fork. You may adjust the amount or proportions to your taste, but keep in mind that the vinegar is more potent than the syrup so only add a little at a time. Add a pinch of cayenne pepper if you have it and want a little kick. Pour over squash and stir to coat. Sprinkle feta or goat cheese over the top. Categories: Campus Cooking, DIY, Dorm and Dining Hall, and Recipes. Cooking Method: At the Dining Hall and In the Oven. I Don't Have Any: Cooking Skill. I Don't Eat: Gluten and Meat.